An illustration shows how a future astronaut might take samples from a captured asteroid moved to a stable orbit in relation to the Earth and moon. Image released Aug. 22, 2013. NASA is getting some help in mapping out its ambitious asteroid-capture mission. The space agency has awarded a total of $4.9 million to 18 proposals that could advance and flesh out the asteroid-retrieval plan, which aims to drag a space rock into orbit around the moon for future visitation by astronauts, officials announced today (June 19). NASA received 108 submissions after announcing the request for proposals in March. The selected studies are a diverse lot; some seek to develop asteroid-capture systems, while others focus on rendezvous technology or adapting commercial spacecraft to meet the needs of the mission. One of the winning 18, submitted by the nonprofit Planetary Society, suggests putting hardy Earth microbes on the robotic asteroid-capture spacecraft to test how feasible it would be for organisms to travel from planet to planet on or inside rocks blasted into space by a cosmic impact. The idea is a variant of the Planetary Society's Living Interplanetary Flight Experiment (LIFE), which aimed to hitch a ride to the Mars moon Phobos and back aboard Russia's Phobos-Grunt sample-return mission. But LIFE (and Phobos-Grunt) crashed into the Pacific Ocean in January 2012, the victim of a launch failure. NASA is still figuring out exactly how to pull off the asteroid-capture mission. The agency is considering two major options — retrieving an entire small space rock (one less than 33 feet, or 10 meters, wide), or plucking a boulder off a bigger asteroid. That initial phase of the mission would employ a robotic probe. But once the rock is in lunar orbit, the agency would send astronauts to visit it using the Orion capsule and Space Launch System mega-rocket, which are scheduled to fly together for the first time in 2021. The goal is to execute a manned mission to the captured asteroid by 2025. Doing so would meet an exploration goal laid out for NASA by President Barack Obama in 2010. 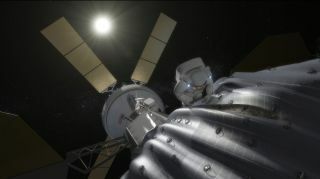 The asteroid-retrieval mission will also help develop the technology and techniques required by for a manned Mars trip, which is planned by the mid-2030s, agency officials have said.